In brief: Pret a Manger asked us to try out their new hot pot lunches, part of Pret's Hot Food Menu and I have to say, in this endless winter, it's a welcome request. 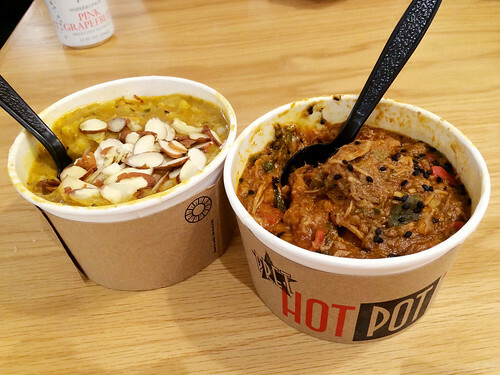 The new hot pots at Pret are not like pot pies, which is somehow what I was thinking. They're a more substantial lunch than a soup, which is nice if you're craving something hot but also quick and easy. We tried a Korean BBQ and cauliflower curry, which came over a red rice or dark grain of some sort. Pretty enjoyable for $8 and no wait time whatsoever. We were particularly partial to the cauliflower curry, we'd get that again.